Among the many questions, budding anglers and the general public ask themselves is Can Fish See in The Dark? After all, they seem to be doing pretty well in deep waters where the penetration of light is pretty low. Those that seem to be in the know often say that the best time to fish is early in the morning before the sun rears its head. But the central question, then is how do they find the bait? Could it be through their sense of smell or the any other? 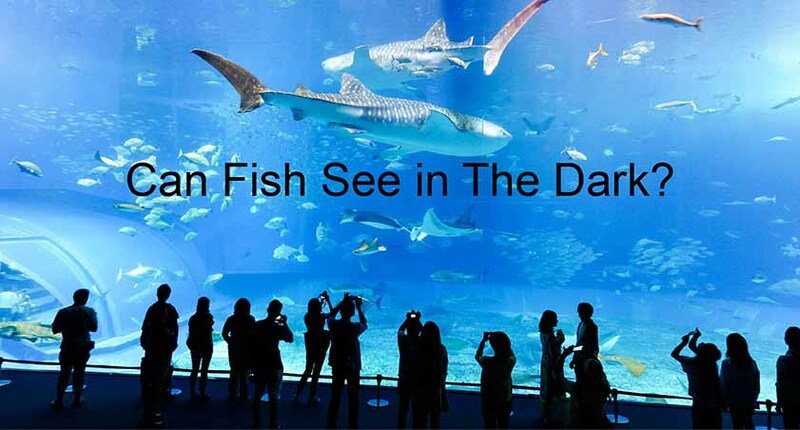 Understanding their Vision | Can Fish See in The Dark? And how do Fish Hunt in the Dark? Can Betta Fish see in the Dark? Do Dolphins see in the Dark? And so is Darkness Important to Fish? There are thousands of fish species on earth. In fact, it may come as a surprise for you to know that there are over 29000 species of fish on the planet. However, there are still thousands of unidentified species, according to scientists. There are also about 200 new fish discovered every year so you can imagine how many they are. As a result, we cannot answer with certainty whether fish see in the dark or not. However, we can discuss the different fish varieties and how they see or perceive their environment. Basically, it is hard for you to see when making sudden head movements. You cannot take a good quality photo of an object on the move. So how are the fish eyes able to stabilize the image? In fact, this is the role of vestibule-ocular reflex mechanism that keeps the image at the center of the field of focus even in fast motion. Naturally, when the head moves to the right, the eyes go to the left. The majority of fish have a lateral line running down their side and which contain Neuromasts. As a basic, the fish use these Neuromasts to tell what is around them. Scientists can now prove that fish use electric fields to find their prey even in total darkness. Correctly, the elephant fish produce low current electricity to tell how far an object is with some level of accuracy. These fish varieties find their way through the African freshwater rivers in darkness through the low-level electric current they emit from their tails. A Bonn University zoologist contends that the fish can use electric fields to create a three-dimensional image of their location. They can tell the distance of objects in the dark just the same way we can tell how far something is through our eyes. You have probably seen those Deep Sea documentaries, and it is apparent that the environment is almost dark. Water absorbs light, and as you go deeper, the amount of light reduced significantly. Different water bodies absorb light of varying wavelengths differently. This means that one water body can absorb a particular wavelength better than the others based on varying chemical and salt content. Most of the fish have color vision and can see ultraviolet light. So how do the barracudina, viperfish, Fangtooth, and bristlemouth see in the low lighting surroundings? Current research indicates that the inner ear is one of the most critical sensory organs for fish. They can detect any water pressure changes in the water and respond as necessary. And apart from their hearing, these fish depend on their sense of smell to navigate the deep dark waters. The eyes of some fish like the Mesopelagic are adapted to low lighting conditions. As a result, they can see pretty well in what you can think are dark conditions. Their adapted eyes are always facing upwards and can sense light very well. Even though their lateral vision is pretty weak, all they require is just a glimpse of the prey to lay an ambush. The flashlight fish produce low amounts of light through blinking and can use it to detect their prey. Even though little is known about these fish, there are experiments indicating they blink five times slower when the prey is close. Goldfish are the most common types of fish kept by human beings as pets. A few of your friends may even have them. And despite their small size, goldfish have acute eyesight, better than yours by far. In other words, goldfish can see better than you. Goldfish like most other fish have a high sensitivity to polarized light. This light prominent during dawn and dusk. When reflected off the scales of other fish, the polarized light aid in carrying crucial information such as the proximity of other fish and their orientation. This ability also allows fish tell when there are predators around and thus avoid particular reflections. Polarization may as well explain why goldfish move closer to you when it’s feeding time. But do Goldfish have other Senses? Goldfish also have an excellent source of smell which they use to get around in the tank especially at night. They utilize their lateral line system to detect changes in them and respond appropriately. Even though this attractive variety can see in low lighting and avoid predators, its vision is quite weak. The fish have a monocular vision to see in two different directions at the same time. However, their depth perception is lacking. And to compensate for the reduced eyesight, they depend on lateral line. They thus can determine water pressure as they move closer to objects – this is almost like seeing. Dolphins are quite adorable creatures that use adaptations like echolocation to find their way around dark waters. Echolocation is the clicking sound waves dolphins produce and they use their lower jaw to sense bounced waves. Their inner ear then helps the sea mammal have better perception and localization. In other words, they can sense their surroundings better regardless of whether it's dark or not. Dolphins use this system also to find their food even 600ft away. They can tell the shape and direction of movement. Echolocation is also like an x-ray vision that Hollywood heroes use because dolphins see through objects to find hiding prey. However, that does not mean their vision is poor. In fact, they see better than us in water. Their adapted lenses and corneas allow them to see both in and out of the water. Their retinas have rods and cones allowing them to have an adequate vision in dim or bright lights. There is a tendency among aquarium owners to leave the light on through the night. What they might not know is that fish sleep during the night and darkness is necessary to achieve this. As a matter of fact, leaving the light on may actually be a source of stress for your pet fish. They may start fighting as a result or grow lethargic and stop eating. Another associated problem is algae overgrowth. A 24 hours-lit tank encourages the growth of algae more than anything else making your tank look dirty and unkempt. Just like the rest of us, the fish just need someplace quiet and safe from all the chaos of living and nap. They need to recoup some energy to face a new day. Their ideal nap places could be under rocks, coral crevices of logs – somewhere away from the predators. The parrotfish is one living being with an interesting adaptation. It utilizes its spit to create a sort of sleeping bag. The bubble masks the fish's scent hiding it efficiently from other fish. Should another fish or sea animal bump onto this bubbly sleeping bag, the fish senses arouse and can make a quick getaway. Most animals stay still when asleep, but this is never the case with fish. They always swim around slowly even when sleeping – much like sleepwalking. It is imperative for them to keep moving to maintain a constant flow of water past their gills so that they can take in oxygen. Larger fish like the shark just move at a slow pace than when awake. Smaller fish may just flap their fins. There are thousands of fish species, and so it is pretty hard to tell with certainty whether they all can see in the dark. However, the majority of them can but poorly than the daytime. Some of them have adapted eyesight where they use sensitive cones and rods to see pretty well in light and dark conditions. Therefore, successful night fishing is not all about the fish and their poor vision but the skills of the angler. Nighttime is ideal as the temperatures are more relaxed and the waters are calmer. You are also competing with very few other fishers. There are also those who believe that it's easier to catch catfish at night than during the day, but nothing could be further from the truth. While some varieties come out at night to feed, there are those that do it during the day.